Today I read another screed about why managers make bad hiring decisions. It referred to the usual facts about manager biases, the failure of unstructured interviews, and the need for assessments and structured interviews. Then I attended a webinar about how to use better assessment and interview techniques to present hiring managers with better candidates. The point seemed to be that if you give hiring managers only superstars, they will be less likely to make a mistake. No doubt better techniques will help, but that won’t make hiring managers interview better. In LinkedIn’s Global Recruiting Trends 2016 study, respondents said quality of hire is the most important hiring metric, but only 33% of those believe they have a reliable methodology. QoH was still the #1 metric in the 2017 report, but it didn’t discuss methodology or respondents’ trust in metrics. If you search for metrics for quality of hire, you can easily find long lists of metrics that may or may not have anything to do with quality of hire. There are as many opinions on how to measure quality of hire as there are people who want to measure it, but most companies depend on tenure, time to hire, and manager satisfaction. None of those indicate the quality of the people you hired. It only means you hired them quick, they are still around, and the manager likes them. 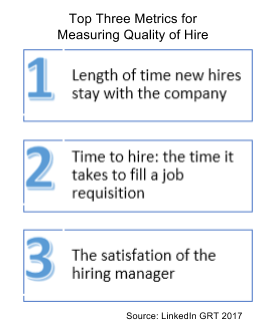 “99.9% of organizations have no idea how to measure Quality of Hire. If you don’t know how to measure it, it doesn’t mean anything. We also find recruiters held responsible for quality of hire when it’s the responsibility of managers to hire quality. We want to offer up a different way of thinking. We can take a page from the book of staff augmentation. In the contracting world, measuring performance is easy when both parties agree to the expected outcome. If your contractor delivers as agreed, it was a good hire. If your business performs better because the contractor influenced the way your organization works, it will be a great hire. If you set expectations before the hire and the employee meets your expectations, you have met the standard of a quality hire. Teaching managers about hiring biases and how to use structured interviews is important but much less so than establishing clear expectations. That happens in the first interview – when the recruiter meets with the hiring manager. Whether it is a contract hire, direct hire, to temp-to-permanent hire, understanding what the candidate is expected to do is where quality of hire starts. It continues when the manager conveys an honest assessment of the team culture, and further in the discussion about how the organization will assess the candidate’s performance. Start by writing a job description based on outcomes, not duties and responsibilities. Set the objectives at the very beginning of the relationship. Let potential candidates who don’t want to stretch their capabilities weed themselves out. Simplistic? Perhaps, but you won’t know until you try. Focus on that first interview and see what happens. 1. Sackett, Tim. "Quality of Hire is Meaningless!" The Tim Sackett Project. August 15, 2016.